A spectacular flight north across Lake Aleknagik then west traversing the Ongivinuk River valley to Togiak Lake where Peter Ziesing, his son Will, and I landed. We unloaded the aircraft at a creek full of Sockeye Salmon and said goodbye to our pilot. 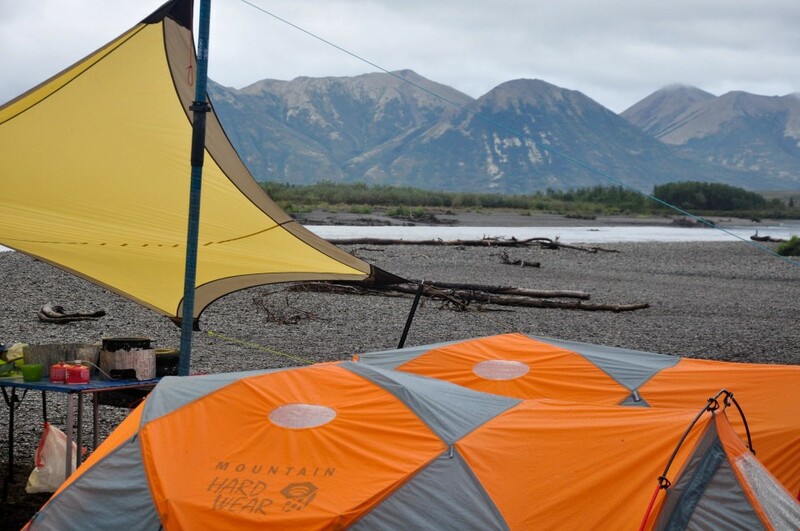 For the next six days we’d raft and fly-fish and camp, planning to cover 60 river miles. 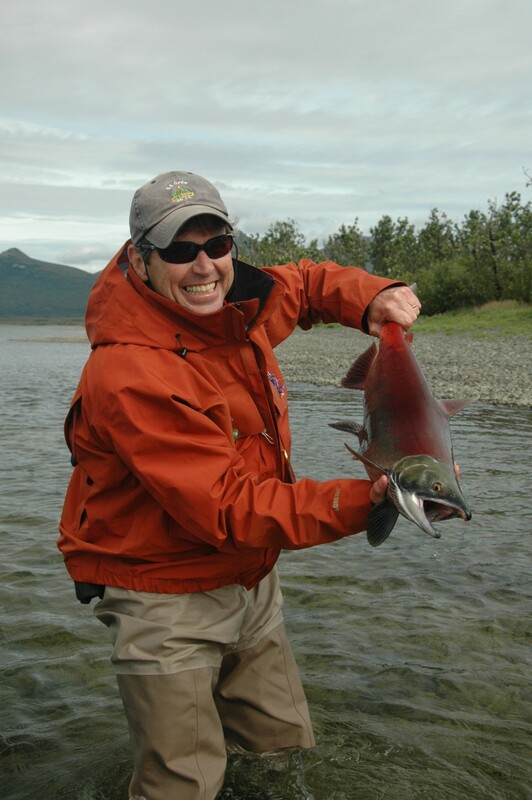 Peter released 2 Sockeye and Will engaged several Dolly Varden. 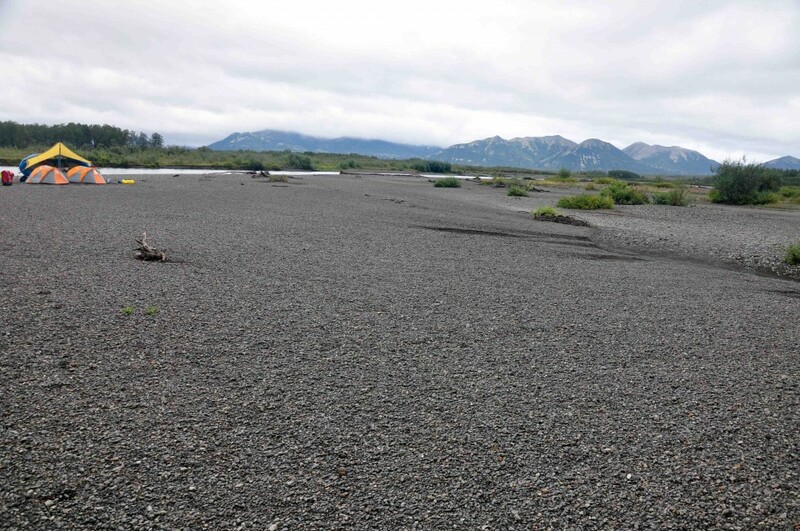 The Sockeye were spawning in the gravel of Togiak Lake. From the air the spawning area had appeared blood red with fish. In front of us we could see the gravel had been cleaned of moss and salmon nests, or “redds” had been created by their tail flapping motions. The Char were intermingled with the Salmon. 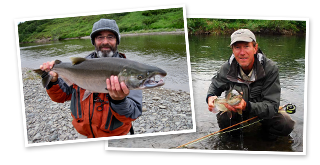 Peter & Will love the camping, angling, the wildlife, and other shared moments of outdoor pursuits. It is particularly poignant for Will to be here. He’d spent 30 days on a NOLS course last year in the Wrangell St. Elias mountains of eastern Alaska. Will had learned a ton about hardship, and travel under extremely arduous conditions. While we hoped to travel in much greater comfort this coming week it was splendid to know that he had the training and resolve forged in his prior wilderness experience, should we have bigger challenges. And we would indeed have weather and river challenges. 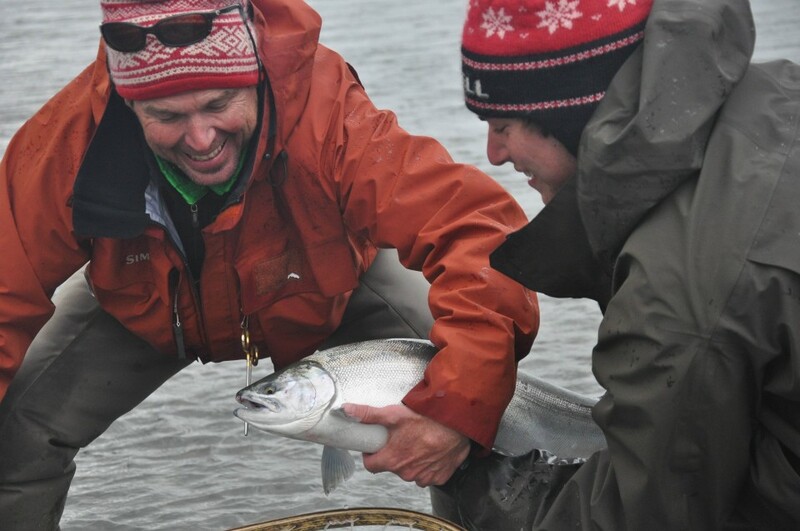 We caught and released Coho Salmon, Arctic Char, and Dolly Varden Char. It was interesting to compare the two Chars. The Dolly Varden were plump and feisty while the Arctic Char had the large headed appearance of fish on meager rations. Yet both were feeding on Sockeye spawn; why the difference? And contrasted with Rainbows which again were plump and well proportioned. The Rainbow is resident and the Arctic Char are resident and both adapted to the Togiak River after thousands of years of post ice age isolation and evolution. 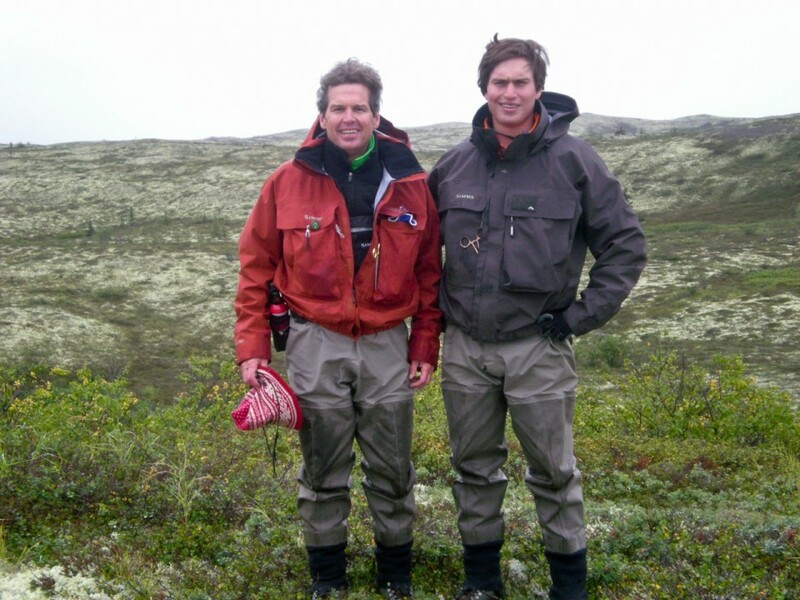 Why don’t the Arctic Char appear more robust? One answer may be that they are best adapted to the lake environment where in the winter and early spring they feed on vast numbers of Sockeye salmon fry. Then once those fry exit the lake in early June they are less well adapted to eating natural foods like Caddis, Mayflies, Sculpin and Stickleback. Once the Chum begins to spawn in July and the Sockeye in August you would think the Arctic Char would bulk up on eggs. Apparently not so simple. They may be behaviorally unsuited for raiding nests of the aggressive and territorial salmon. We watched a young Brown Bear walking up river as we floated the final ½ mile to camp. 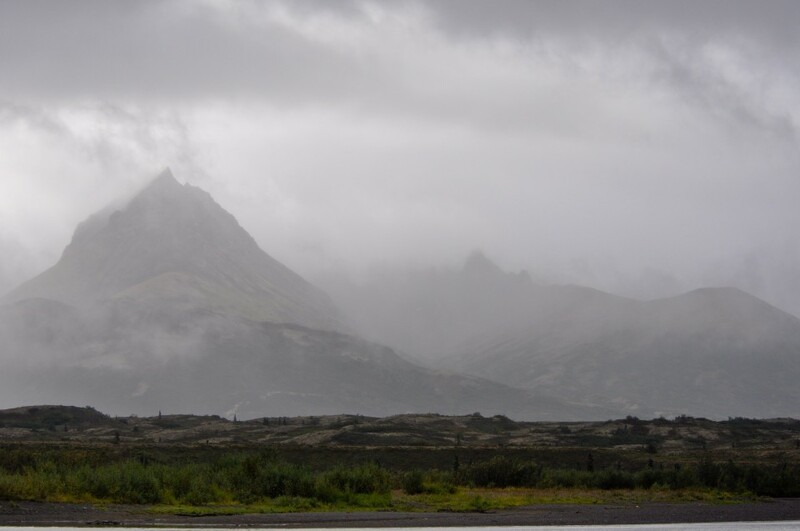 From the log of day two August 31, 2013: “Fog, mist, and light showers all day. We rowed 15 miles through an alpine environment of Caribou moss, and blue berry shrubs, the willows turning yellow. We hiked up a bluff at noon to get our circulation pumping and to warm up in the chill air.” When you gaze out at this vast, vast, land of glacial moraines, and ice sculpted peaks, with scarcely a tree the horizon seems limitless and one’s eye can roam without seeing any sign of man. We savored the viewscape then descended and continued down river. As we rowed between Sockeye Salmon spawning beds and deeper channels they cast flies and Will shared stories from NOLS and from his first year at college. Autumn had come to the valley in the past weeks and the small songbirds of summer have departed along with the sandpipers and other shorebirds. A Merlin (falcon) cast back and forth overhead looking hungry and the other larger birds, Bald Eagles, an immature Harrier, Magpies, and Glaucous-winged Gulls went about their business cleaning up spawned out salmon carcasses. 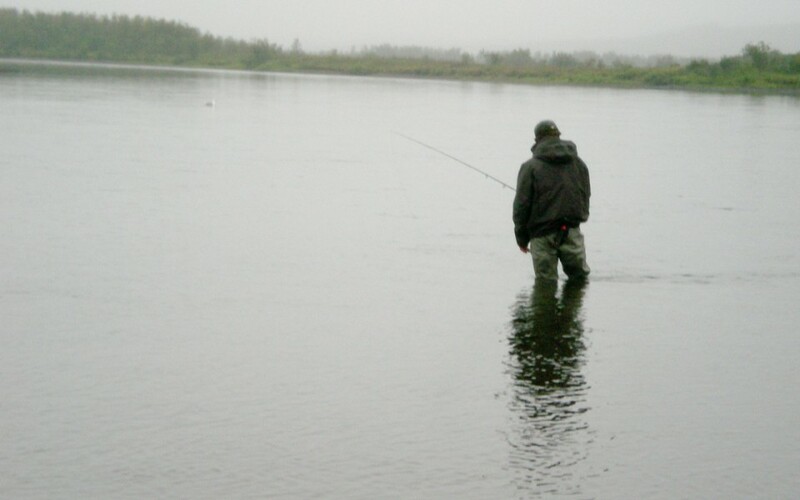 We passed below the confluence with the Ongivinuk River casting streamers in a steady rain. The barometer fell from 29.60 on Aug 31- to 29.25 on September 1’st and the river level was beginning to rise. Peter took a lovely Rainbow with a streamer while fishing a channel targeting scattered Coho Salmon, which refused the flies. Then below a group of spawning Kings Will took a nice Rainbow. We hushed our conversation and pointed at the sow Brown Bear and her 2 small cubs. Our raft pulled to the far side of the channel and she could not see us so she proceeded to move along while gazing intently into the water. Her cubs were dog sized. Perhaps the size of spaniels but not as large as a Labrador. They were a cinnamon brown color and followed along behind. Then the cubs got an idea to divert toward blueberries up a steep bank and before long were separated while mom searched for fish. At that point it became incredibly apparent how a well-intentioned angler could get between well-intentioned brown bears cubs and a sow without knowing it. The sow continued fishing upriver and all of a sudden the cubs realized mom was gone and raced off in pursuit. She plunged into waist deep water and put her head under. Standing up for greater visibility she peered about for salmon and then plunged her head under. Again standing tall on 2 legs she searched for fish and plunged in. We were mesmerized and watched until she’d exhausted her possibilities at that fishing spot and moved along upriver in search of more spawning salmon. 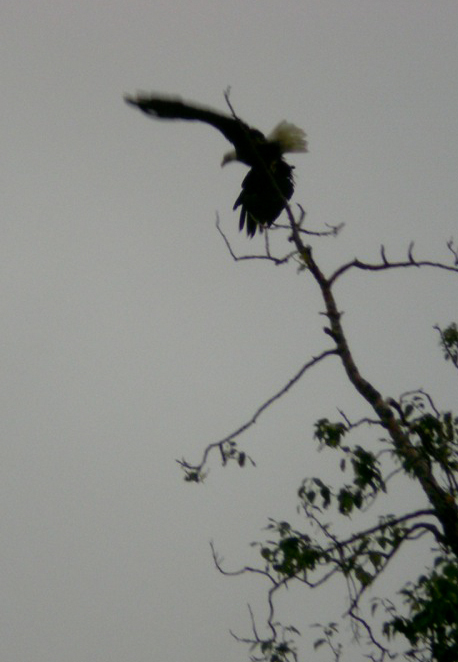 We continued on downriver where we watched an adult Bald Eagle drive a young eagle away from its territory. It was curious to us that the adult eagle was so defensive and territorial this late in the season. Perhaps she had her own young nearby. The Log recorded “The barometer continued to fall to 29.05. Rain all last night tapering to misting showers at 6:30 am and then clearing. Lying in the tent at dawn I listened to the plaintive calling of a solitary Greater Yellowlegs sandpiper, the only one of the trip.” It’s been over a week since I’ve seen any shorebirds on the river, just Red-Throated Loons, a few Teal, and Mallards. Even the Mergansers and Harlequin Ducks have departed. It is autumn on the Togiak and the birdlife has moved to the estuaries where they will stage in large numbers feeding prior to migration. At the tail of an island in the quiet water a Coho Salmon porpoises and we pulled the raft over. The sun was out, the sky scrubbed clean after two and one half days of rain and we cast. Peter hooked three Silver Salmon and lost the first after a great battle, the others too. Peter and Will were transitioning from their prior experience as New England Trout and Bass anglers to taking on much larger, more aggressive, hard to manage fish. Coho, fresh from the salt, chrome as a car bumper are unforgiving. 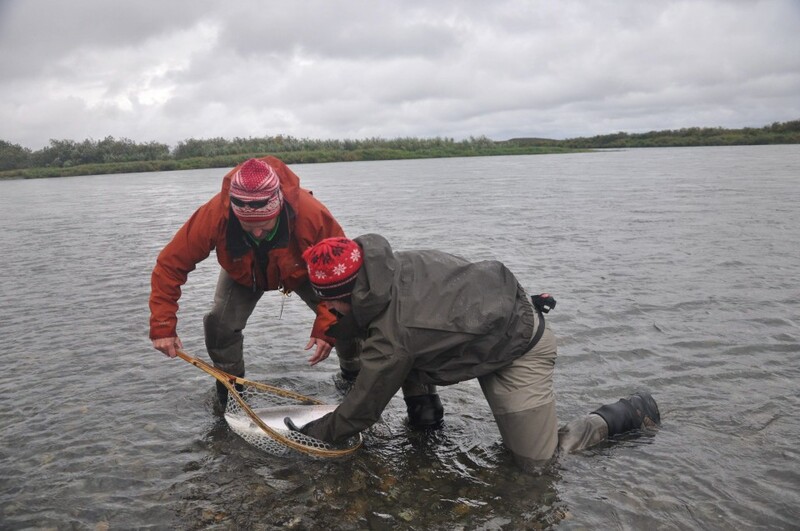 But the sun was out, fresh fish were pushing up the river, and so we pushed on fishing through the middle reach of the river in water, which is the most productive of the Togiak. I anticipated we’d find Coho and Dolly’s staged in good numbers at the mouth of the Kemuk River. We pushed downriver searching for Coho to the confluence of the Kemuk. Shock! It was a raging, mad, dangerous torrent. It carried enormous amounts of sediment. Now we realized the impact of all that rain of the prior 2 days. The mountain headwaters of the Kemuk had taken a big slug of rain and its notorious canyon must have been raging and the river cutting through banks carrying away soil, dry algae, and driftwood. It was unsettling and nerve wracking to attempt to fish nearby the floodwater. Furthermore in the next several miles the Togiak would pick up 2 more tributaries from the same mountain range. Would the Togiak be fishable? Would the Togiak be safe if the next several tributaries were as high as the Kemuk? Would our mission shift to survival or would we still be in the recreation modality? 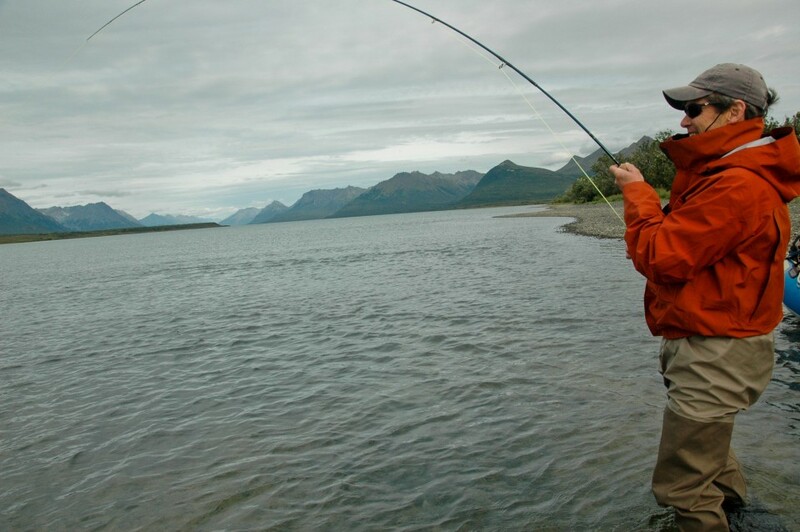 How does a wilderness fly fisherman deal with the unknown? What challenges are we willing to accept as the price we’ll pay for fishing as part of a truly untamed landscape, which dwarfs our presence. The Coho were flooding into the river stimulated by the surge of fresh cold rainwater. We’d seen the bright Silvers jumping on Peter’s fly line just hours ago. But now with days of rain and rising water our little group had to be very careful and consider how we’d fish, travel and select camps in rising water conditions. We chose the evening campsite with some additional elevation and marked the water level with several rock cairns to measure the rate of change. From the log of September 3, 2013: “Marine layer all day (fog) and rain and drizzle. Headwind. 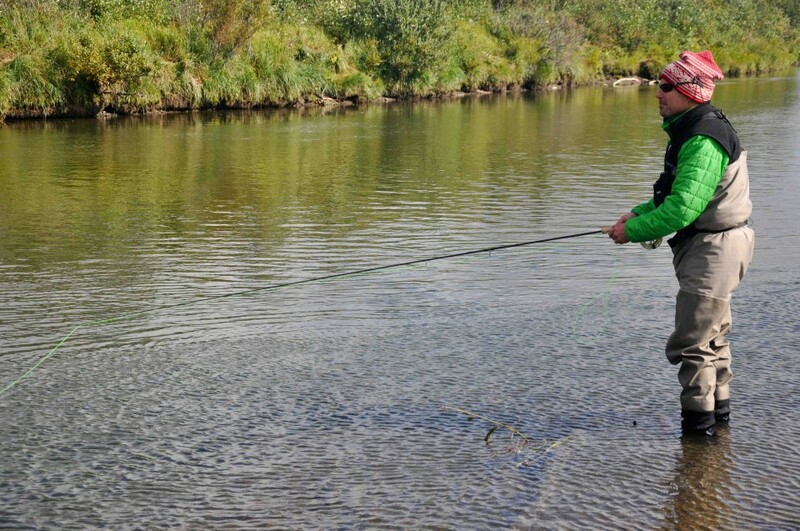 Will caught a truly spectacular Togiak River Rainbow Trout on a purple and pink streamer fished deep. He has learned so much this week that it’s hard to believe he hasn’t had a fly rod in his hand all his life. He’s changed so much as an angler in the past 4 days. His casting, his line management, playing the fish has all come together. He earned every bit of that trophy trout. On our final afternoon in the lower river below the Pungokepuk in some nameless slough, unremarkable from all the others Will continued to cast his heavy streamers. 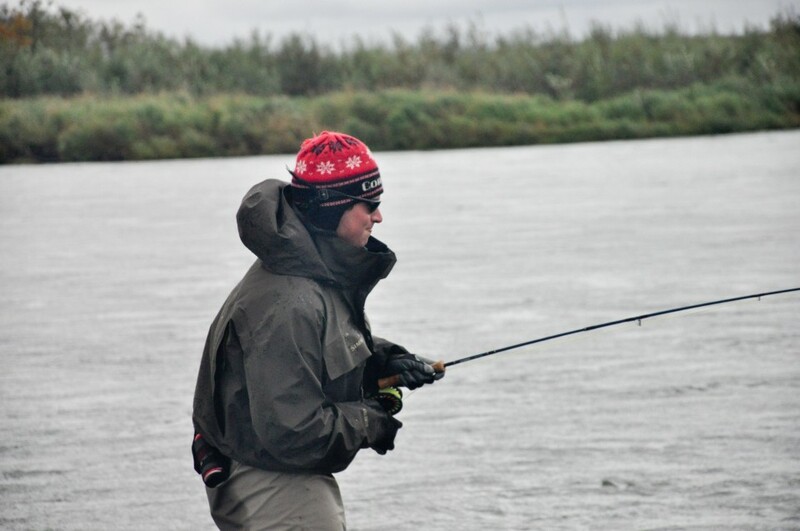 The wind was unkind all afternoon and we’d put in 8 hours of hard travel and casting already. He’d taken a lovely acrobatic Rainbow as we passed by a parked floatplane and powerboats of lodge anglers who were heaving hardware at the mouth of the Pungo. Now downriver some miles away from the lodge group he saw a fish porpoise near the bank and put the fly on the target. Bang! 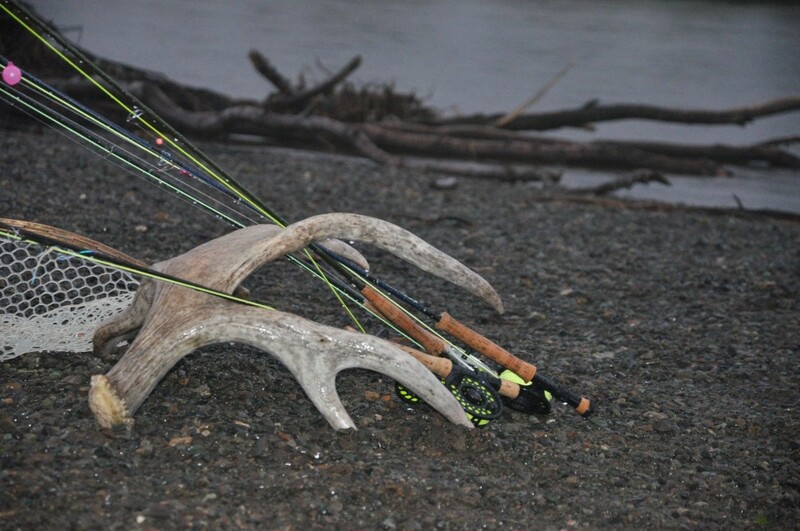 One dozen pounds of silver raged across the river tentatively attached to the fly rod. If we could land this beast it would cap a spectacular week. But never, ever with a hot Silver Salmon is the end clear. They have the power and the energy of a saltwater fish in a river full of driftwood snags and gravel bars. He Did It! We set up camp well above the high water again. The Togiak River, while not yet in flood stage, was high and plenty worrisome. We ate our smoked salmon, Fettuccini pesto & pine nuts, and fresh Dolly Varden fillets. 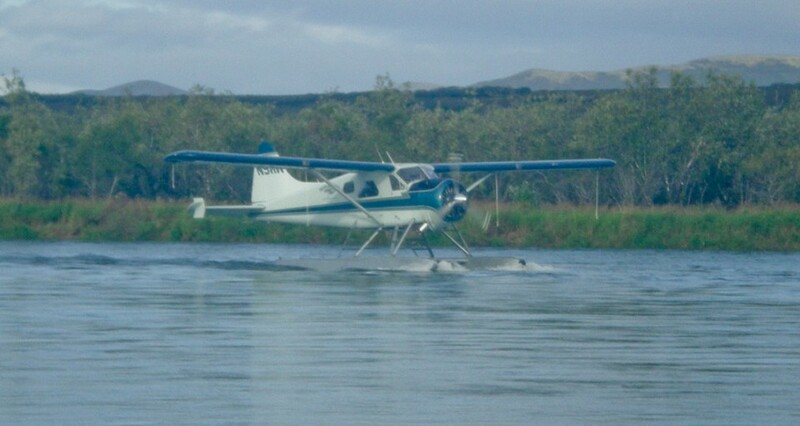 After dinner I checked in by satellite telephone with our pilot and got a weather forecast calling for deteriorating stormy conditions in the days ahead and we moved our floatplane pick up off the river forward by one day till tomorrow morning when there was a “flyable window” in the forecast.